Most of us would never dream of clubbing our animal companions to death, shooting a bolt into their skulls, or slitting their throats and hanging them upside down to choke on their own blood. In many places, it’s illegal to torment and kill dogs. But PETA Germany’s new ad urges everyone to have empathy for all animals, who—just like dogs—feel pain, love, joy, loneliness, and fear. 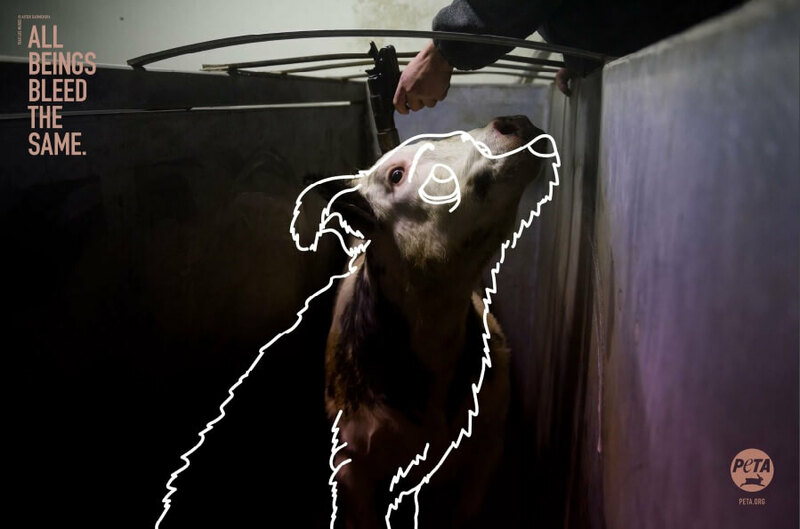 The new ads juxtapose drawings of frightened dogs over heartrending, real-life images of cows and pigs right before their deaths in slaughterhouses. 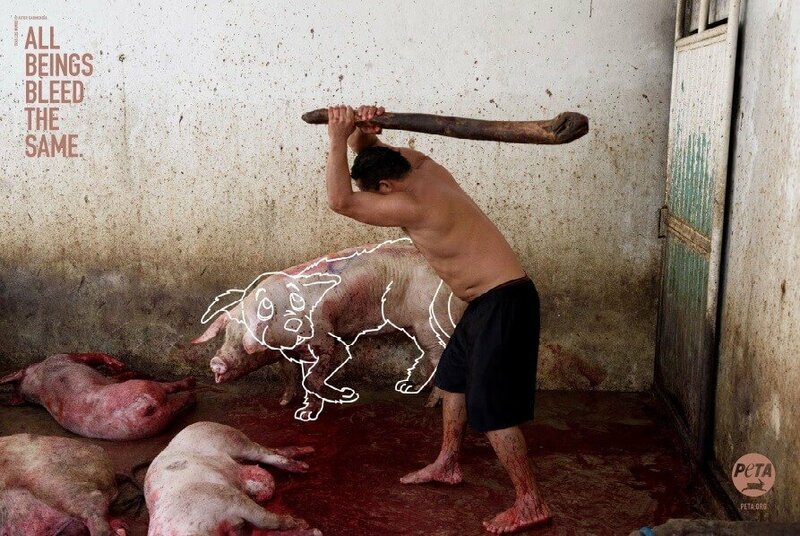 Some of the slaughter images come from a two-year examination of 58 slaughterhouses in Mexico by an organization of investigators called Tras los Muros, or “Behind the Walls.” Mexico is one of the world’s leading producers of cow, chicken, and pig meat, and the U.S. is a main destination for it. 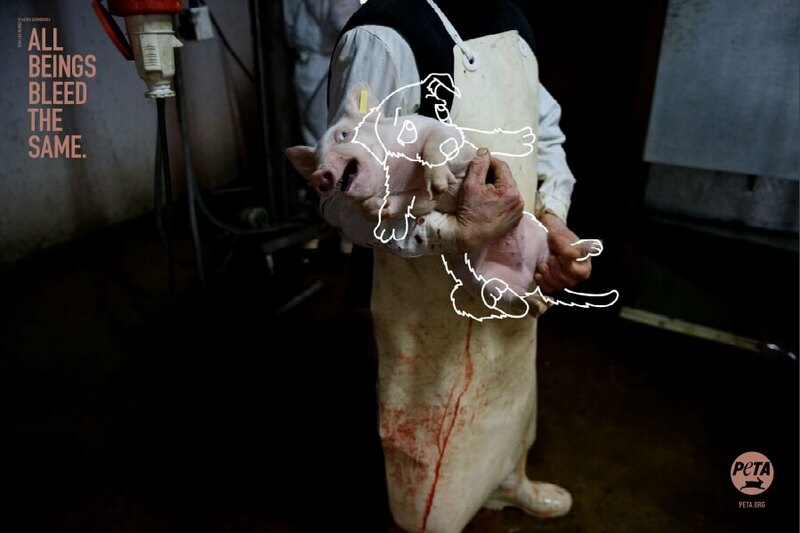 Other images come from a similar investigation into slaughterhouses in Spain. Around the world, animals scream in fear and agony as they’re butchered for their flesh. Animals suffer throughout the entire process of their exploitation: They endure lives filled with misery and abuse on farms; are subjected to a crowded, stressful transport; are punched, kicked, and electrically shocked at the slaughterhouse; and are finally hung upside down, slashed across the throat, and left to bleed to death in a pool of their own blood. Like all other forms of supremacy, speciesism must be dismantled. In all the important ways, animals are just like us. They cherish their lives and will fight to the very end to escape pain and suffering. You can help end so much suffering by simply choosing not to eat animals.